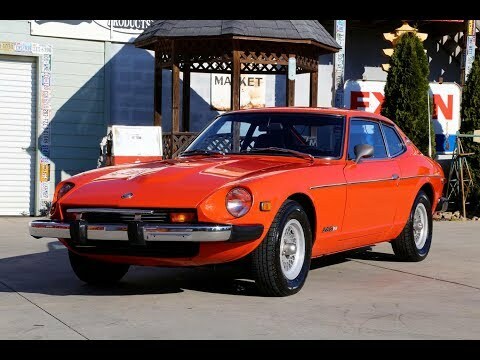 Up for sale we have a 1976 Datsun 280z 2+2. The 2+2 280z had a different rear side windows due to the back seat. The one we are offering is showing only 69,415 miles which is great for a 41-year-old car. This is a factory A/C car. It also retains the factory orange color. Looking down the sides the panel fitment is very good with straight panels. All the glass looks very good with all the window seals good for its age. The trim around the glass is good along with the front and rear bumpers. When you look at the paint it is good with a nice shine, but with any 41-year-old car the paint shows some age and has a few nicks. The wheels were updated to a set of aluminum wheels with 205-70-14 tires. On the inside, it is all done in black with vinyl seat covers and door panels. The front seats look to have been re-covered. The back-seat, carpet, and door panels all look stock. When you look at the dash there is a couple of cracks in the top above the vents the rest looks good. Also, it has the 160 MPH speed and a tach with a 6500-red line. This Datsun also has the rear window defroster. The radio is a AM/FM and the A/C is factory to this car. Under the hood it is powered by the Inline Six 168.4 CI engine. It is hooked to the 3-speed automatic transmission. The engine is stock with the factory fuel injection. The radiator was changed to an aluminum. This car has power disc brakes and standard rack and pinion steering to go along with the factory A/C.